The name Anemone is derived from the Greek for wind flower. The Anemone colors include white, pink, red, blue/ violet. The blooms of the Anemone flowers are usually saucer-shaped. Leaves have serrated edges and are usually mid to dark green in color. The white Anemone flower are by far, the must popular color choice for a bride’s bouquet or to make elegant centerpieces for a wedding. Anemone are delicate flowers, avoid displaying in warm environments. Therefore, if you are looking for an elegant and delicate looking flower, look into the Anemone to bring beauty and elegance to your floral arrangements. 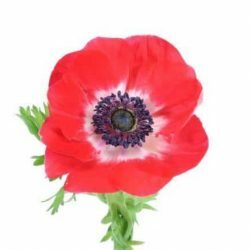 Buy Anemone Flower online for a wedding or special occasion floral decorations.